When Colfax Avenue was “Colorado’s Main Street,” a miles-long constellation aglitter with motels, restaurants and gas stations, Eddie Bohn’s Pig ‘N Whistle was its brightest star. Bohn was dubbed the King of West Colfax, and from his throne at “The Pig,” as regulars affectionately knew his motel and restaurant, he presided over an empire the likes of which North Denver will never see again. Visitors included Jack Dempsey, Roy Rogers, Babe Zaharias, Jimmy and Tommy Dorsey and Wally Schirra, to name but a few. For 65 years the Pig ‘N Whistle and its larger-than-life proprietor reigned on West Colfax, and North Denver basked in their reflected glory. Earl W. “Eddie” Bohn, born in 1902, was the son of German immigrants who owned the J.J. Bohn Brush Company at Colfax and Wolff where they made corn husk brooms for industrial use. Eddie attended Sacred Heart School and early in life showed a head for business. As a youngster he launched the Rocky Mountain Skunk Company, with business cards promising, “There’s more profit in one skunk than there is in a dairy cow, with less work.” He persuaded his father to buy land at Colfax and Wolff. “I was 14 at the time and planning a boxing career and told him that when I got older, I’d buy back the land and build a car agency,” he told the Lakewood Sentinel in 1982. “I never went very far in school and I didn’t learn very much when I was there, but I sure learned a hell of a lot on the way there and back,” he once said of his early interest in boxing. When he was 18 the six-foot, four-inch Bohn headed to California on a motorcycle to seek his fortune. He soon took up boxing and fought 64 professional matches, winning all but two bouts, which he tied. He was crowned Rocky Mountain Heavyweight Champion in 1924. He hired on as Jack Dempsey’s sparring partner, earning $100 for each round with the Manassa Mauler. “Each round he would tell you that he was going to throw one good punch, but he never told you when it was coming,” Bohn recalled. He and Dempsey became lifelong friends. “He was a helluva guy,” said Bohn. With sparring proceeds for a grubstake, Eddie bought the four lots on Colfax from his father and in 1924 opened a gas station and barbecue joint there. He’d been impressed by a chain of West Coast restaurants named the Pig ‘N Whistle and adopted the uncopyrighted name for his own business. His timing was perfect. The Federal Aid Road Act of 1916 and the Federal Highway Act of 1921 called for creation of “an adequate and connected system of highways, interstate in character” and the nation embarked upon an era of highway construction. U.S. Highway 40, which transited Denver along Colfax and passed right by Bohn’s front door, was born of that legislation. U.S. auto registrations tripled in 1920s as auto-oriented businesses blossomed. The Motel Inn, which opened in San Luis Obispo, California, in 1925, is generally considered the ancestor of today’s motels. Enterprises such as the Alamo Plaza Hotel Court chain in the South, began appearing in the 1930s. With money lent by his friend, U.S. District Attorney Tom Morrissey, Bohn built four motel units to make the Pig ‘N Whistle Denver’s second motel. The business drew nourishment from increasing traffic on Colfax and also attracted Denverites to its restaurant and bar. The Pig was a mecca for pugilists. “Anybody that was in the boxing business, when they’d come through Colorado they’d be there,” says Scherer. Bohn dubbed Room 39 the “Jack Dempsey Room” to honor his friend and frequent guest. Other famous boxers who stayed there were Max and Buddy Baer, Primo Carnera, Gene Fullmer, Carmen Basilio and Gene Tunney. 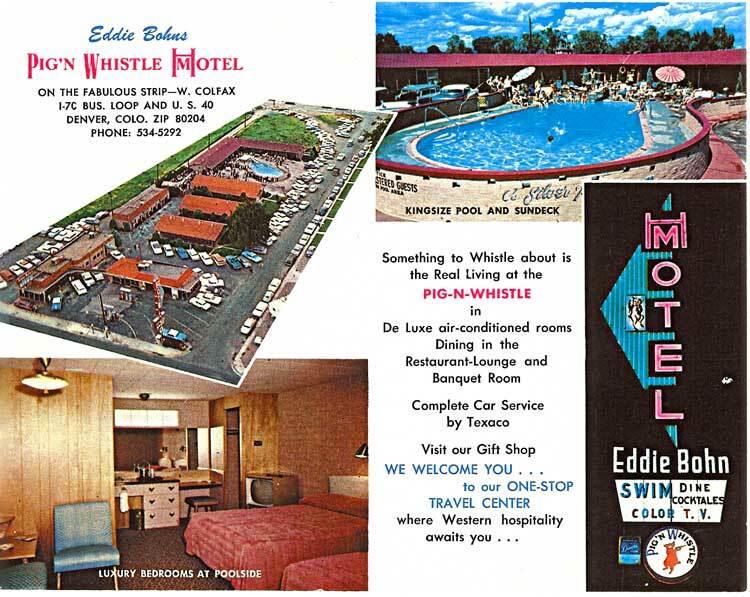 While in town to play at Elitch’s Trocadero or Lakeside’s El Patio ballrooms, big bands like the Vic Jurgens and Eddie Howard groups stayed at the motel. Jimmy and Tommy Dorsey once honored its owner with “Eddie Bohn Night” at the Trocadero. The restaurant was also a favorite haunt of area notables. Governors “Big Ed” Johnson, Steve McNichols and his mayoral brother Bill were familiar faces at the Pig. Fred Dickerson, Tom Morrissey, Tony Zarlengo and Mike Pomponio, heavyweight North Denver Democrats, were regulars. Chet Nelson, sports editor of the Rocky Mountain News, and his wife Sammy were close friends of the Bohns and could often be found at the restaurant. Bob Palmer, long time news anchor at Channel 7, ate there frequently. Highway changes in the 1950s and ‘60s sent West Colfax into decline. The aging Colfax Viaduct was closed, severing the artery that delivered downtown diners and cross-town travelers. Colfax businessmen lost a battle with the Colorado Department of Transportation over what Punch Bohn calls “confusion junction,” the intersection that bends Colfax-bound traffic onto 6th Avenue Freeway. Interstates -25 and -70 were built without exits for West Colfax, choking traffic flow even further. A colorful chapter in North Denver history ended when the Pig ‘N Whistle closed in 1991, the year after The King of West Colfax passed away. Article reprinted with permission of the North Denver Tribune. The best part of the Pig ‘n Whistle was Eddie Bohn himself. He greeted everyone by name as folks came in or would come by your table when you had been seated. I used to go to lunch there with my dad and brothers in the 1980s and he would come over to our table. “How’s it going Tom, Bill, Joe, Mary Lou” – he remembered everyone’s name. My favorite lunch was the open-faced beef sandwich with mashed potatoes and gravy. The waitresses had name tags with their hometown printed on them, ie “Norma from Lamar” and we’d frequently see the Denver Zephyrs, predecessors of today’s Rockies. The restaurant’s walls were covered with murals of the Three Little Pigs and the ladies room was all pink tile and round mirrors. I drove by the place last summer and was sad to see it being used as an auto repair shop – the sign is gone and it’s painted over. It would be wonderful if the neighborhood could revitalize the place, but you could never find another Eddie Bohn. I remember the place, it was always packed. The first time I went there was with my boss Ralph Laumbardi a personal friend of Eddie. it the was back in the early 80’s. I’ll never forget the experience. Denver lost a great part of it’s history with it’s loss. REMEMBER it well……we spent our wedding night there …June 3, 1956. That was a VERY CLASSY place to stay..It was always our Favorite place for a nice dinner and entertainment…..
My family stayed many times in the 60s& early 70s. My dad knew Eddie and he was so nice to us kids. Great pool, so many photos of Eddie with all types of sports and other celebs. I am reading my Grandma’s diary from 1929. She was a 15 yr old that summer. She mentions eating at “the Pig” just about once a week! I remember going there as a girl myself in the 1980’s. 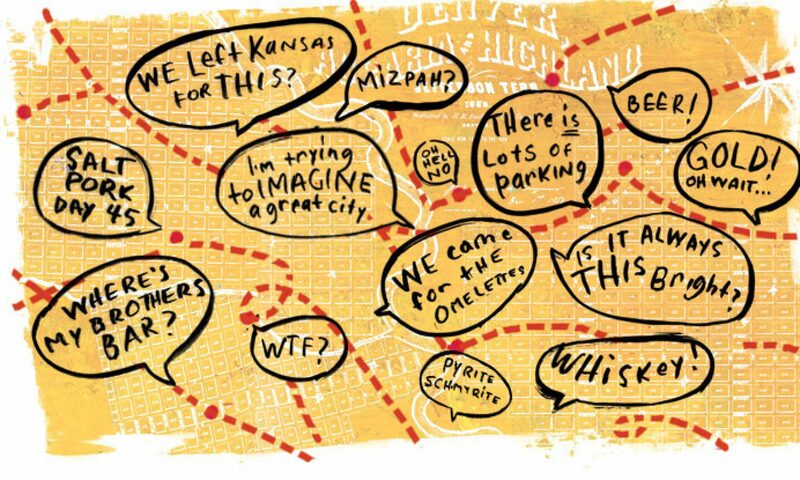 Lots of Denver History… Thanks for the article. I wasn’t sure if her reference to “the Pig” meant The Pig N’ Whistle. Thanks for clarifying. In 1966 I met Eddie Bohn Briefly in the Pig n Whistle. He was very friendly. I asked him if all the famous autographs were real and he replied, “You bet they are.” I was a kid in C. A.R.I.H. , the children’s Asthma Hospital. I had been invited to dinner by a friend of mine Nick Collura and his father visiting from New York. We walked in and Eddie knew and greeted him right away. I wish now I had taken some time and got to know Eddie Bohn better.